Fuller eyebrows is the new thing. Personally I’ve always preferred it, hence why I don’t tweeze my eyebrows. For this past fall and as of lately, make-up artists are emphasizing these brows while the rest of the face stays more neutral. I encourage that all women grow out their eyebrows. Eyebrows that are too thin are not flattering, in my opinion. 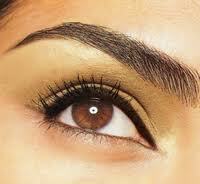 If you do choose to grow out your brows, you can use eyebrow pencils and powders to fill them in as they grow. I will make a later post to explain how to fill in your brows, until then happy growing!